It uses this information to calculate the current value of the furniture so that you can sell it to your housemates, or split up furniture fairly when moving out. But how does it work? The difference in value between a “Like New” couch and a “Good condition” couch is a subjective question, and there wasn’t an off-the-shelf formula we could use. So we asked our survey respondents what would be a fair price of a $1000 couch in various conditions, and we extrapolated this response to be a fixed percentage of the purchase cost for all types of furniture. Clearly, assuming all furniture is the same as a $1000 couch is a simplifying assumption, but we have a reason to think it will work better than you might expect. For instance, you might say wear and tear on a kitchen table or a TV stand is just different from wear and tear on a couch. But our survey revealed that the average life of those items is similar, and experts such as the IRS and our accounting panel downplay differences between furniture in accounting purposes. For instance, while tables and arm-chairs tend to “last longer” against wear and tear than couches according to our survey, people still typically replace them over roughly the same time-frame. What matters to fairness is how an owner is likely going to keep something, not how long it could hypothetically last. But what about a TV? TV’s and other pieces of electronics don’t usually get “damaged” – they become obsolete or the prices fall really fast. According to our survey, it takes about 5-6 years for respondents to replace such items. That’s where the other part of the calculator kicks in. No matter what condition the item is in, it loses value to you with time, because eventually, you want to replace it with something newer, nicer, or more to your taste. Since this typically happens over a 5-6 year cycle for both electronics and furniture, the fair value of any shared item declines similarly regardless of type or condition. We could quibble about seven years vs. four in the most extreme cases, but in the interest of simplicity we did not worry about these issues. After all, there is a lot of individual variation in quality between brands and individual items. Personally, Jon would guess that five years is probably also a good time scale for replacement of basic kitchen appliances like blenders, but we did not test this assumption at all. To calculate this effect, we depreciate the value of furniture using a somewhat standard accounting formula. This is more of a planning-guide than a solid fact, and it probably isn’t exactly what you could get for the item on the open market. But what it does do is try and approximate a market via the survey, while creating a consistent guideline for your housemates. After the program calculates the time-depreciated value and the difference-in-quality value, it takes the lesser of the two numbers: being old or being broken both devalue an item. Good and Acceptable values for a $1000 couch in their average time-frame. 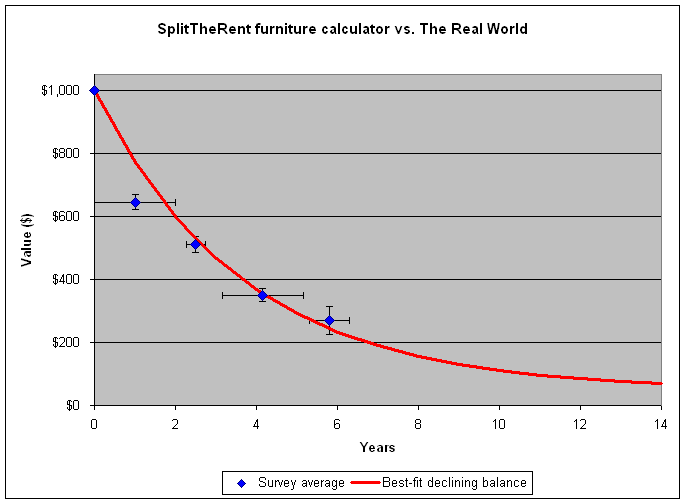 This calibration matched real-world data, given the average time period it takes for a couch to reach a given condition, and the average fair value of a piece of furniture in that condition. We hope to document the methodology more technically in a later blog post – for now, you can email Jon at contact@splitwise.com with questions. How do you calculate antiques? Just reverse the formula? At what point does the price increase due to aged value? If send u a pic of the dining room table , can u please tell me how much it’s worth selling now? It’s 11 years old and from Europe? I have read many contents about the furniture from many blogs and as well as other blogs, I liked this weblog also because of keeping some effective matter of calculating furniture which I was expecting.